Doctor Who: not just a pretty face | Marie Loughin's "I WANNA BE . . ."
I realize it’s cool to like Doctor Who, these days. Fans pop up in the most unexpected places, from High School jocks to University librarians. My daughter uses the show as a sort of litmus test. If she tells me, “Hey, Mikey likes Doctor Who!” then I know Mikey has achieved at least second level respect in her eyes. Friendship is a distinct possibility. But it wasn’t always that way. When I was a kid, there were only four television channels to choose from. 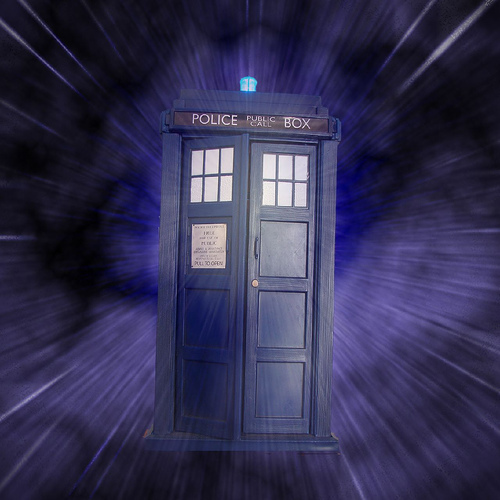 Despite the slim selection, I never heard another kid mention the words “Doctor Who.” I discovered the show only by accident on a Saturday of extreme boredom, when no Godzilla-esque movies were airing and the Wide World of Sports was following a marathon. A few minutes of watching athletes splash cups of water into their own faces motivated me to get off the couch (no remotes) and change the channel. In desperation, I tried PBS. And there was The Doctor. I don’t remember what episode it was. I do remember that I was instantly hooked by the odd British guy with the curly hair and excessive scarf. Yes, that was a very long time ago. No, I’m not going to tell you how long. Look it up, if you really want to know. I believe there is only one incarnation with a scarf. So why am I telling you this bit of personal history? To establish my credentials as a geek—er, a longtime fan of The Doctor. Because I have a beef with the younger generation—those who joined the party with David Tennant or even as recently as Matt Smith. Listen up, neo-Whovians: THE DOCTOR IS NOT REQUIRED TO BE CUTE. Look, newbs, the Doctor is required to be clever, brilliant, dark, silly, quick-witted, handy, a good guy, dangerous, hard, compassionate, and any number of other characteristics. But good looks? Well, that’s just an accessory. If you don’t get that by now, then you don’t really get Doctor Who at all. Personally, I think Peter Capaldi is a brilliant choice. I mean look at him. LOOK AT HIM. This entry was posted in My Inner Geek and tagged David Tennant, Doctor Who, Doctor Who fandom, Matt Smith, Peter Capaldi, The Sixth Doctor, The Twelfth Doctor. Bookmark the permalink. This gave me a giggle. I will admit, I only very recently “discovered” Doctor Who (Christopher Eccleston was my first doctor), but I can definitely agree with you…appearance is not a necessity at all. I love the Doctor because he’s witty and fun and a bit insane, while also being lovable and compassionate. If you’re watching a show like this just because the actor is cute?…yeah, you’ve definitely missed the point! My son is a big fan. To be honest, I’ve never watched the show. I know… I should! Oh, you definitely should! Some of the cleverest writing on TV. Especially some of the Tennant episodes. My dear friend…I’m sorry to admit, I was watching Godzilla! Great post!